The DreamLine Aqua Ultra is frameless shower or tub screen with European appeal and modern architectural design. With a stunning curved silhouette that creates an open, inviting feel, the Aqua Ultra will transform your bathroom with elegant style to match its functionality. Configuration: Stationary Panel with Swing Door and Return Panel. Model is reversible for a right or left wall installation to fit your specific layout. Stationary panel requires a Support Arm for additional stability. 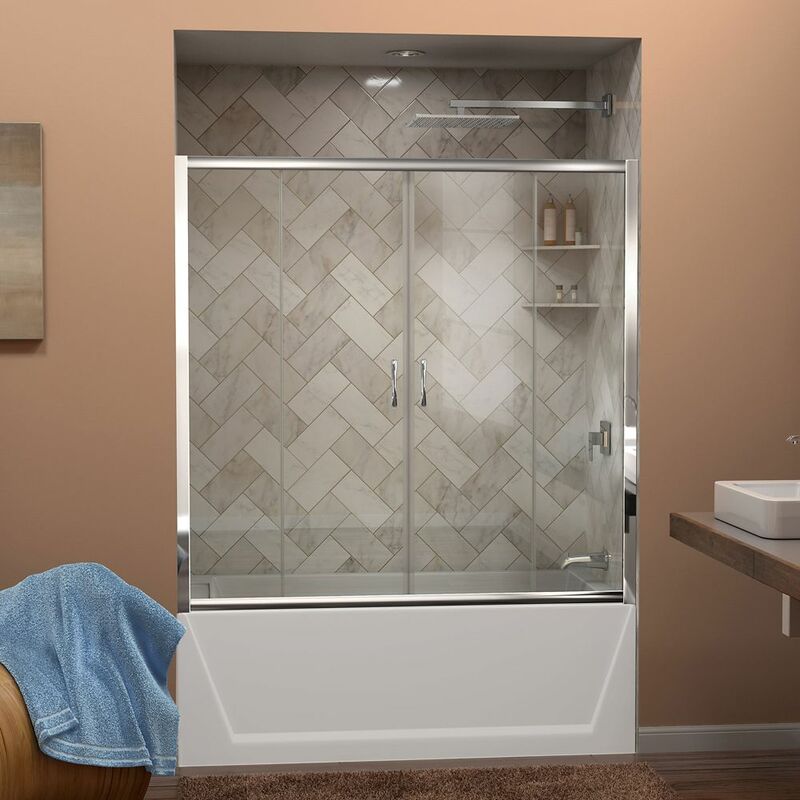 Visions 56-inch to 60-inch W x 58-inch H Framed Sliding Tub Door in Chrome with Handle is rated 4.5 out of 5 by 22. Rated 5 out of 5 by Stella from It is so Beautiful, I looked for weeks for the... It is so Beautiful, I looked for weeks for the perfect Tub Door. Sadly, my existing tub surround was not "Plum" and Installer measured and tried twice but to no success. A real disappointment to me. Not product's fault just my surround. Absolutely recommend this Tub Door. Rated 5 out of 5 by Ejs024 from I just finished the install. Just wanted to say Dream Line has added the things that other revie... I just finished the install. Just wanted to say Dream Line has added the things that other reviewers thought would be necessary. My door came with a bag of extra parts. I think the instructions were OK' but could be improved upon. The part about adjustments should be expanded. Over all it took my daughter and I about 3 1/2 hours to make the install. Rated 5 out of 5 by Blessed from This was the perfect shower set. It made my bathroom look so elegant. Would degidefini purchase a... This was the perfect shower set. It made my bathroom look so elegant. Would degidefini purchase again. Rated 5 out of 5 by otiv from nice door for the money bought this 2 months ago for our bathroom renovation. Rated 3 out of 5 by Boris from The bathtub door.looks very nice. I have started using it... The bathtub door.looks very nice. I have started using it one week only and can say nothing about the quality of the product. I gave 3 stars because of the poor installation instructions. I am not a professional installer and this installation was my first-time installation. The installation took about 5 hours. My product is bathtub shower door, but all pictures and steps in instruction mention for the shower door installation. Some steps described in installation, not in right order or it hard make it. For example, I think step 10 need to be made before step 9 because the frame becomes more weight after assembled stationary glasses. If the company will provide the movie for this bathtub shower door installation that will help a lot for people who do the job yourself. Rated 5 out of 5 by bath2 from the framed sliding tub door was a perfect fit and brought a new beauty to the bathroom. the framed sliding tub door was a perfect fit and brought a new beauty to the bathroom. Rated 5 out of 5 by AM from This is a beautiful shower and the pocket doors are fantastic! Was not difficult to install just... This is a beautiful shower and the pocket doors are fantastic! Was not difficult to install just READ the directions first. My husband and 18 yr. old son installed and said super easy. It's in our boys bathroom and they love this shower door, easy in and out and cleaning (squeegy). We are next installing a master shower enclosure, frameless and since this was an easy install will also DIY (save labor $$). We have been extremely pleased with our purchases with HomeDepot and their shipping timeframes. Rated 5 out of 5 by BigBob from Great Shower Door! Very unique styling!! I installed these shower doors about 3 weeks ago. We love them! Installation was pretty straight forward and the only time I needed another set of hands was when we set the completed assembly on the tub ledge. We love these and the center opening is very unique and classy!! !